Our first reading and our Gospel this morning relate two different stories of conversion. They occurred at different times and among different peoples. In both cases and in every episode of conversion, God is the catalyst for the move to faith by the human person. The first conversion occurs in our first reading, which relates the story of how the Israelites, who have been just liberated from Egypt rise up and complain against Moses for having led them out to the desert where there is no water. The Israelites complain that if Moses does not find them any water soon, they will surely perish. I've always felt bad for Moses. In a business paradigm, he would be the cursed middle manager. He has a very exacting CEO (God) and he has lower level people (the Israelites) who he can't seem to please. Moses really suffered and here, he entreats God to help once again. God vindicates Moses by providing water from the rock that Moses strikes at a place called Meribah (which means "contention") and Massah (which has been translated as "proof"). This leads to the Israelites coming to faith in God. And yet, the manner in which the Israelites come to faith is almost shameful. They've witnessed the ten plagues and participated in the miracle of the parting of the sea, which allowed them to escape the Egyptians. You would think that this would be enough proof for them that God would continue to provide for them. Yet, time and time again, we see how the Israelites complain against God when things don't really go their way and when they don't get what they want right away. This is a lesson for all of us in our journey of faith. How often do we find ourselves complaining against the Lord when we don't really like His timing or when we really don't think He listens. God is always drawing us to closer faith in Him and sometimes, He allows us to wait on Him so that we will learn who really is in charge and so that we will learn to trust in Him. As a friend of mine likes to say, God does not subscribe to the Burger King motto - have it you way! The Catechism states that lack of trust in the goodness and power of God means tempting God and it may be a grave sin against faith. When the human person meets some contradiction or some difficulty he cannot immediately solve, his faith may waver but he should never doubt, because if deliberately cultivated, doubt can lead to spiritual blindness (cf. Catechism 2008). The second conversion occurs with the Samaritan woman at the well with our Lord. In order to better understand this story, we should take a brief moment to consider the relationship between the Jews and the Samaritans. In a country that prides itself on racial diversity and pluralism, it's sometimes hard for most contemporary Americans to identify with the intense rivalry that existed between the Jews and the Samaritans. In brief, the Jews despised the Samaritans not only because they were foreigners of Jewish background but because the Samaritans mixed with the Assyrians, who were the sworn enemies of the Jews. The Samaritans tried to reconcile with the Jews after the Jews returned from the Babylonian exile in order to rebuild the Temple, but the Jews would have none of it. We know another Samaritan - the Good Samaritan. Jesus praises this person, a sworn enemy of the Jews. That was quite a statement to make and it stung the Pharisees to the heart. So, for Jesus to be addressing a Samaritan woman alone was bordering on scandal in his day. First, women never traveled alone - they always went in groups. Jesus, as a respected person in Jewish society, often referred to as "Rabbi," probably raised some eyebrows when He is found by His disciples speaking to a foreign woman alone. We know that Jesus' love for this woman and her soul was nothing but pure, chaste, whole and totally manly. He reveals to men how to love women in the truest sense. Jesus is unencumbered by human convention. His interest lies in the conversation occurring in the heart of the Samaritan woman. The Gospel also tells us that Jesus is tired - it's perhaps why He doesn't go into town with the apostles to look for food. Yet, He's never too tired to do the Father's will - to complete His mission of seeking out the heart and mind of even this foreign woman. And so, the exchange between the Lord and the Samaritan woman begins. At first, the conversation between Jesus and the Samaritan woman is a bit esoteric, a bit unclear. The Lord uses her curiosity to reveal to her his divine identity and He does it little by little: he shows that he knows about her life, the secrets of her heart; he can even read her conscience. In this way, he gives her enough to motivate her to make her first act of faith when she says, "I perceive you are a prophet." The Samaritan woman perceives that Jesus is a person of authority. Her conversion has already begun. This first grace that our Lord gives the Samaritan woman to come clean about her life is called Prevenient Grace. It's the grace that immediately precedes a conversion. So, even our first move back to God in conversion is already a grace. Our Lord describes this movement of the heart in terms of the water in the well. When Jesus describes the water that He will give and describes it as a spring of water welling up to eternal life, our Lord is using water to describe the grace that He gives which nourishes the soul and quenches its thirst for God. This is foreshadowed by the water that the Israelites sought in the desert in the first reading. 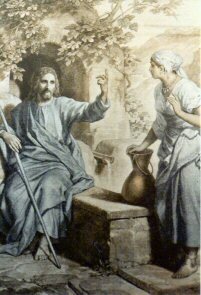 As the full conversion of the Samaritan woman transpires, Jesus reveals Himself to her as the Messiah, the Christ. The word for Christ means "anointed." Sometimes, I have young children tell me that they think that Christ is our Lord's last name. So, you'd have Mary Christ and Joseph Christ as well. In this final step of conversion, the Samaritan woman has come from acknowledging her sins to accepting the true teaching about worshiping the Father in spirit and it truth. Grace brings about a real change in the woman - she leaves her pitcher behind and goes off to tell her friends of her discovery of Christ. Just like the Apostles who left nets to follow Jesus and tell others about Him, this woman's genuine conversion has a natural projection towards others - a desire to share the joy in finding Jesus. There is no regret in the Samaritan woman - she does not lament that her conversion will mean a change in her lifestyle. Rather, she rejoices! The Samaritan woman embodies the penitent who seeks the Sacrament of penance with a contrite heart. Like the Samaritan woman, we too, become foreigners to God when we sin. And yet God seeks us out as Jesus did with the woman at the well. The Samaritan woman, by a special grace, overcomes any nationalistic tendencies she might have felt against our Lord because He was Jew. She takes a great risk in allowing herself to spend time with the Lord alone. She must have been both surprised and ashamed when our Lord starts naming her sins and yet she makes no excuses - she acknowledges the hard truth about herself. All of these movements in her heart are ones that we ought to emulate as we approach the Sacrament of Penance. Going to confession is a humbling experience but is a liberating experience because we confront the truth about ourselves and make ourselves vulnerable to Christ to be filled with His grace and mercy. Jesus knocks on the door of the Samaritan woman's heart, as he knocks on the door of our hearts each day. We can chose to respond in a way similar to the Israelites of Moses' day who didn't even recognize God's presence among them and doubted His very existence. Or we can imitate the Samaritan woman, who came to faith in Christ, not by a physical miracle but by a true openness to the work of the Holy Spirit and a special grace to face the truth. May we not hold back anything from Jesus, turning our very lives over to Him with greater devotion and greater fervor. May the Blessed Mother, who knew this docility in her own life, inspire us to repeat her words at the Annunciation, "Let it be done to me, according to thy word."